I have been erratic as usual in blogging what we have been up to, which often happens when we are too busy doing it to write about it. I am really tired at the moment, and have been going to bed as soon as the children finally settle, but I have made myself stay up tonight in an attempt to catch up. The holidays started with a relaxing and fun Easter weekend at Granny and Grandpa’s. 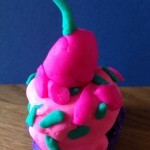 The children enjoyed lots of arts and crafts, cooking and playing, and I enjoyed having time to blog about it all – a one to one ratio is very civilised! Since then life has been a little more hectic. I had two days at home, mainly occupied with washing and packing before setting off annual trip to Butlins in Minehead for Spring Harvest. It is a… well I’m not sure how to describe it… Christian holiday/ conference type thing. I’m sure there’s a better way of putting it. We are the group organisers for our church, and we enjoyed spending time with the other families in our group, as well as meeting new people. having two extra children with us for 24 hours while their parents’ drove home (four hours each way) for their eldest son’s confirmation. This was a lot of fun, and also a highlight because it felt like quite an achievement that it all went so smoothly, and it was nice to be able to help our friends out. Six children? Easy! 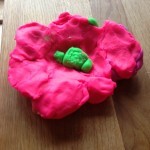 Tiddler’s birthday, which was the last full day. All four children were extremely lucky to be chosen to dance onstage in the final Big Start in the morning (the link is to someone’s video from Week 1 and we were there in Week 2 but it gives you the idea!) Later on, to celebrate Tiddler’s birthday we had lunch with three other families (19 of us in total) in one of the restaurants on site. And for me another highlight of the day was catching up, briefly, with my lovely friend (Owl’s godmother) who came for the day and joined us at the all-age worship in the evening. I always come back from Spring Harvest feeling tired but happy, and inspired about something new. 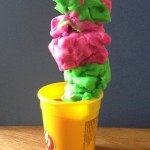 This time I got most excited by a conversation with others from our church about the idea of starting a “messy church” service, which we have been wanting to do for a while. 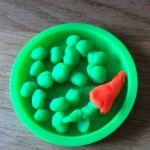 It was good to discover that the others liked the idea too! 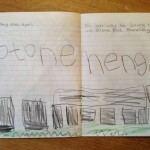 On our way to and from Spring Harvest we drove past Stonehenge, and the children drew some great pictures for our Prehistory project when we got home. We have also started a new project based on a Friends and Heroes DVD which we bought at Spring Harvest, along with a curriculum pack for home educators. And today we have been making the most of the sunshine with a whole afternoon of messy play in the garden, involving rice, split peas, flour, shaving foam and water. I really need to blog that separately I think. Tiddler hasn’t been very well for the last few days, but he seems to be getting better and he really enjoyed playing in the garden today. I hope Spring is finally here! 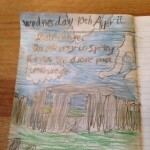 This entry was posted in Family life, Holidays, Playing and tagged friends, Holidays, messy church, playing, Spring Harvest on April 14, 2013 by Hannah. 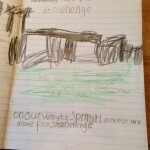 I love the joined up very black writing in the pictures of stonehenge! Sounds like great fun! What was the name of the curriculum pack you got at Spring Harvest? Thanks! I’ll have to check that out.